I can't say as I blame you. Principals can't wait to install another Smartboard, put out another iPad, hook up WiFi to the boiler room, and incorporate computers into everything and everyone. Now, don't get me wrong. I love computers. I love the internet. It's like the public library right here on my laptop. Why deprive anyone of that? On the other hand, there are some things we still need to do ourselves--like writing. How many times have you received a paper with the internet address still on top of it? How many times have you googled a sentence from a student composition to find it's copied word-for-word from Wikipedia or Sparknotes? How many times has the next composition you read been identical to that purloined essay? That's why, especially in writing classes, I demand almost all work be done in front of my eyes. I've given up on assigning writing homework. "My brother/ cousin/ girlfriend/ dog helped me." I don't want to know how your brother/ cousin/ girlfriend/ dog writes. I need to know how you write. 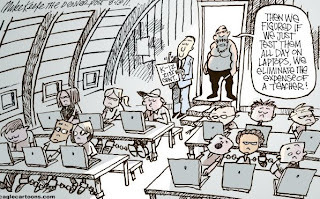 I have nothing against the use of tech in the classroom. For a time last year, by mistake, I was temporarily assigned to a classroom with a Smartboard instead of the barren, too hot, too cold trailer. I used the thing every day. On a computer, I have excellent handwriting, and kids no longer laugh at my miserable indecipherable scrawl. Scrawl notwithstanding, I don't need the Smartboard. I don't even need my little iPad (though you'll pry it out of my cold, dead hands). They're here to help us. They are tools that extend the activities we've already planned. We'd be silly not to use them. But while machines break down, we don't. We need to be able to do without the machines. 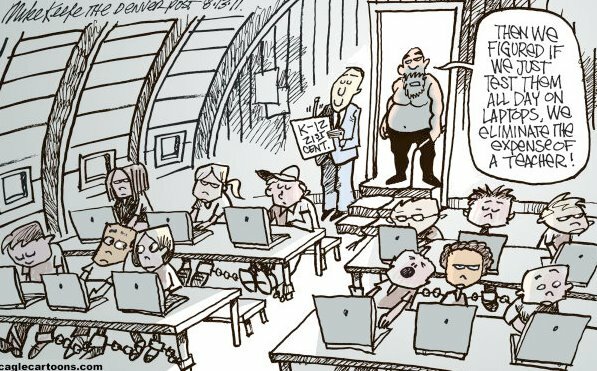 And despite the cartoon, despite the rantings of Bill Gates, machines will never take our place, never be able to answer our students' questions, and never be able to give the guidance we provide--unlike the "reformers," we always look at more than test scores. It doesn't make you a bad teacher if you don't use tech, even if your admin gives you a hard time. But if you can't do without it, there's something other than tech missing from your bag of tricks.